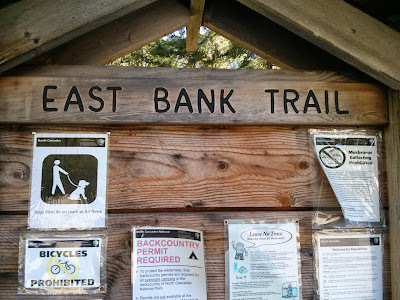 One of the few flat trails in the North Cascades National Park, this 31-mile trail follows the east bank of Ross Lake, connecting the North Cascades Highway (SR-20) to the Hozomeen Campground just below the Canadian Border. Roughly halfway in, the trail connects with the access trail for Desolation Peak, an iconic location in the park. 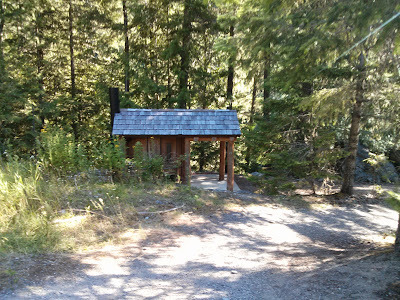 The trailhead is along the highway, just east of the lake. It has plenty of parking, a pit toilet and an information board. 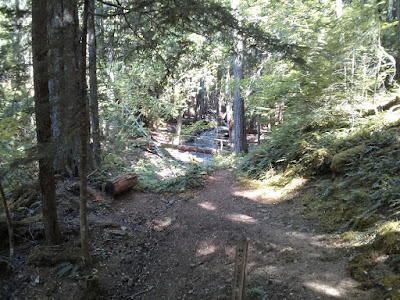 The Forest Service has two good pdf maps, one that highlights the boat-in camps along the trail, and one general hiking map that shows the mileages between key campgrounds. Those maps are good for planning and the trail is well-marked, but for the actual trip, you'll want the appropriate Green Trails Maps. Unfortunately, this particular hike requires a total of 4 maps because of how it's distributed across the quads. The trailhead and the first couple miles are shown on Map 49: Mt Logan, the short section with Ruby Pasture and Hidden Hand Pass are on Map 48: Diablo Dam, and then the bulk of the trail is on Map 16: Ross Lake except for the portion that cuts to the east of Desolation Peak, Map 17: Jack Mountain. 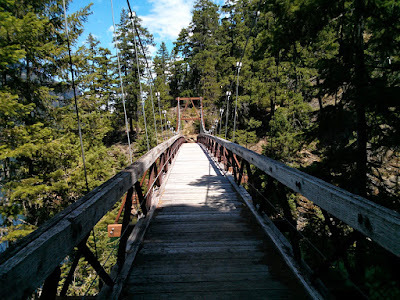 Starting from the trailhead, you'll cross a bridge over the creek and enjoy a mostly flat trail, but no views of the lake. The first major junction is about 2.8 miles in (see Map 48). 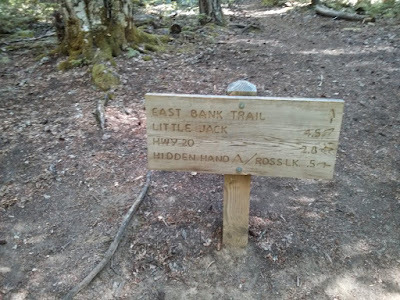 A spur trail leads to the Hidden Hand camp along the Ruby Arm of Ross Lake, a nice place for a break; the trail to Jack Mountain splits off on the east. Continue straight to stay on the East Bank Trail. From here you climb over Hidden Hand Pass, the highest point on the trail at roughly 2,500ft, but it's a gradual climb. 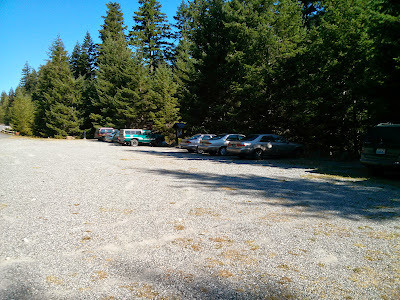 About 2-3 miles later, you'll pass the Roland Creek Campground, and a mile after that, the May Creek Campground. Another mile will bring you to the Rainbow Creek Boat Camp and from there it's a little under 4 miles to the Devil's Creek Camps. 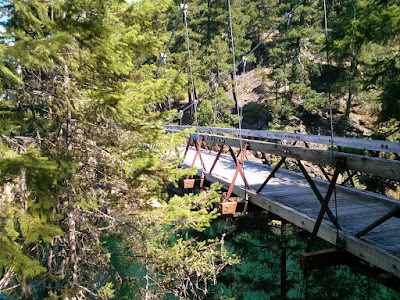 Along the way, you'll cross a really cool suspension bridge. This is as far as a I got on my day hike. It's 3.6 miles to Lightning Creek Camp and the start of the trail to Desolation Peak. From there you jog eastward around the mountain and pass Deer Lick, Nightmare, Willow Lake and Hozomeen Lake over the next 13.5 miles before arriving at the Hozomeen Campground. For details about this portion of the hike, see the trail description from the National Park Service. Finally, if you don't want to hike all the way out, consider the Ross Lake Water Taxi.